Welcome back to our series on Kansas City jazz! Read the first post here. The golden age of jazz in Kansas City came in the 1920s and 1930s, during the Pendergast era and a time when Kansas City was the country’s crossroads. Kansas City jazz musicians were heavily influenced by the ragtime music of the turn of the century (like the songs from Scott Joplin in nearby Sedalia, MO) and by the early jazz musicians coming from New Orleans. As musicians from various musical background mingled in KC, the Kansas City style began to develop. Perhaps the first musician to become a well-known face for the Kansas City style was Bennie Moten, the leader of the Kansas City Orchestra. 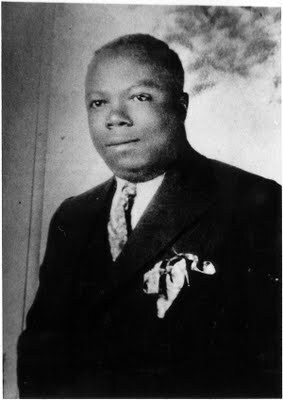 His band’s early recordings, dating to 1923, showed the influence of ragtime and New Orleans-style jazz. By the time they were recording with Victor Records, their recordings were featuring the hard stomp preferred by Kansas City audiences, and the beginnings of a Boogie Woogie piano sound. In 1929, Moten recruited Count Basie, Walter Page, and Oran “Hot Lips” Page to the orchestra, and these three musicians stretched the orchestra’s style and began to form a new sound. Eventually, the band started to exhibit the early “Basie sound” – years before Count Basie began recording under his own name. Bennie Moten died in 1935 at the age of 40, after an unsuccessful tonsillectomy. (Aren’t you glad we don’t have to deal with that anymore?) Still, the recordings of our hometown jazz orchestra – the most successful in the Midwest – remain popular among jazz aficionados to this day. “Moten Stomp” is a song in which you can hear the ragtime and New Orleans jazz influences. The heavy accents fall on the first and third beats of each measure, making this song great for movement to music since it is so easy to find and stay on the rhythm. “South” was perhaps Moten’s most famous recording. Recorded in 1928, this song had a resurgence as a jukebox hit in the 1940s, then remained in print until Victor stopped releasing vinyl records! This instrumental song also has a steady beat, making it appropriate for movement to music experiences. What do you think of this early Kansas City sound? Leave your comments below! Great tunes! It’s hard to explain the feeling I get when listening to this type of music, but it’s a sense of being transported back in time to an era when real musicianship was appreciated, a time when music was expressive, enjoyed, and viewed as the artistic masterpiece that it is/can be. I don’t get that feeling, nor do I anticipate I will get it decades from now, when I listen to today’s music. (Consequently, I really don’t listen to much of what’s out there right now!) When I was an activities director and would play swing music and other types of “reminiscing” tunes, I always wondered: what will I be listening to when I’m in assisted living? Britney Spears? Backstreet Boys? Rihanna? Maroon 5? Kind of a frightening thought. I wonder that a lot, too, Michelle, about what MTs will be playing for me in 50 years. I definitely prefer music from decades before I was even born. I’m only slightly joking when I say it might be something I specify in advanced directives!